The Tel Dor dig, under the guidance and direction of Dr. Ayelet Gilboa of Haifa University and Dr. Ilan Sharon of Jerusalem’s Hebrew University, has just ended its summer excavation season. For more than 30 years, scientists have been excavating in Tel Dor, identified as the site of the Biblical town of Dor. The town’s location, on Israel’s Mediterranean Sea coast some 30 kilometers south of Haifa, made it an important international port in ancient times. According to the archaeologists involved in the Tel Dor excavations, the discovery of the miniature Alexander gemstone carving in Israel is fairly surprising. The Land of Israel was not, for the Greek Empire, a central or major holding. Historically, Alexander himself passed through Dor in 332 BCE, during his voyage to Egypt. It appears that the city fell to him without resistance. Since that time until its conquest by the Hasmonean Jewish King Alexander Yannai around 100 BCE, Dor served as a stronghold of non-Jewish Hellenists in the Land of Israel. Carving of Alexander from Tel Dor. Dor is mentioned in several Old Testament references including Joshua 17:10-11. Thessalonica was located on the east-west Egnatian Way. The city was also located on the Bay of Thessalonica on the Aegean Sea. According to the records we have in the Book of Acts and Paul’s Epistles, Paul never used the sea port at Thessalonica. 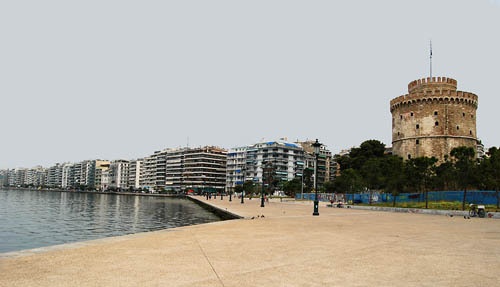 The waterfront of Thessalonica with the White Tower. Photo by Ferrell Jenkins. The tower, called the White Tower, was built in the 15th century by the Venetians or the Turks. It is probably the best known landmark of the city today. Earlier we posted information about the Arch of Galerius. Galerius was the Roman Emperor from 305 to 311 A.D. 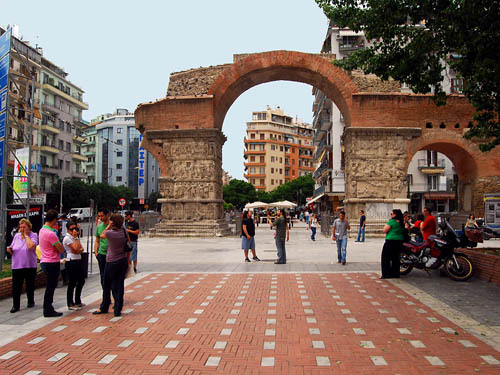 The arch was erected in Thessalonica to commemorate his victory over the Persians in 297 A.D. The reliefs on the arch are about this victory. The most interesting portion of the relief to me is the one showing Galerius offering a sacrifice. The relief has been somewhat defaced, but it appears to me that he is pouring a libation on the altar. To the left, as we view the scene, is the Emperor Diocletian, the father in law of Galerius. The lady on the right is the wife of Galerius, daughter of Diocletian. Note the animal, awaiting his turn to be offered on a larger altar. The altar scene reminds us of the Emperor worship which was prevalent from the close of the first century onward. Sacrifice scene on the Arch of Galerius in Thessaloniki. Photo by Ferrell Jenkins. Diocletian is noted for his decree in 303 A.D. that ordered the burning of all Bibles and church records. This is one reason we have so few manuscripts before the fourth century A.D. Some credit Galerius as the brain back of this decision. He was responsible for considerable persecution of Christians during his reign. This persecution would be that spoken of in the Book of Revelation that we associate with Emperor worship. The Danish archaeologist Dyggve excavated a Palace, Hippodrome, and Mausoleum belonging to Galerius. He also was able to show that the Arch was part of the complex of buildings (Blue Guide Greece). The Egnatian Way was one of the famous Roman roads used by the Apostle Paul in his travels to preach the gospel of Christ (Acts 16-17). F. F. Bruce gives a little history about the ancient road. When Macedonia became a Roman province in 148 b.c., the Via Egnatia was constructed, running east from Dyrrhachium (modern Durres) and Apollonia (modern Poyani) on the Adriatic to Thessalonica, from which existing roads ran to the main Greek cities. The Via Egnatia was later extended farther to Neapolis (modern Kavalla), the port of Philippi, and later still to Byzantium on the Bosporus. When the Roman province of Asia was formed in 133 b.c., the Via Egnatia (with a short sea-crossing at either end) provided easy communication between Rome and the new province. (The Anchor Bible Dictionary, 6:649). Very few remains from the first century have been exposed in Thessaloniki. Remember that the second largest city of Greece is built over the ancient city. 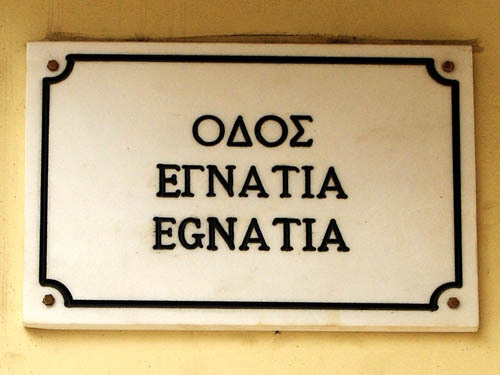 One of the important streets running through the city is named Odos Egnatia (the Egnatian Way). The small street signs in Thessaloniki are located on building rather than on the corner of the street. This makes it difficult for a stranger to drive and read the street signs. Street marker in Thessaloniki. Photo by Ferrell Jenkins. The Via Egnatia runs beside the monumental Arch of Galerius. This arch was built in A.D. 304 to commemorate the emperor’s victory over the Persians in A.D. 297 (Reddish & Fant 136). Arch of Galerius (early 4th century A.D.). Photo by Ferrell Jenkins. The church of the Thessalonians had many questions about the second coming of Christ. Paul addressed these questions in the two letters he wrote to the church from Corinth. We know little of individuals associated with the church. Jason seems to be one of the earliest converts in Thessalonica (Acts 17:5-9). Aristarchus, a Macedonian of Thessalonica accompanied Paul on the voyage to Rome (Acts 27:2). He was one of the messengers who went with Paul on the return from the third journey (Acts 20:4). When Demas forsook Paul he went to Thessalonica (2 Timothy 4:10). 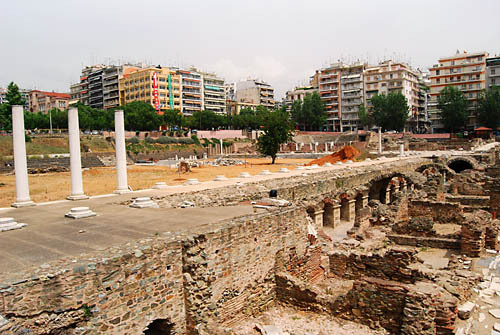 The photo below shows ruins of the Roman Forum in Thessaloniki, the second largest city of Greece. This area of the city was destroyed by a fire in 1917. During preparations for constructing new buildings these ruins were discovered. They date to the second and third century A.D. (See Fant and Reddish, A Guide to Biblical Sites in Greece and Turkey, 137). Perhaps there are older ruins below these. Notice how the modern city is built around the ancient ruins on a higher level. Can you imagine what might be underneath all of those buildings? Roman Forum at Thessalonica. Photo by Ferrell Jenkins. This morning I wanted to share a photo made from Qumran on the western shore of the Dead Sea. Weather conditions were fairly good that day. You can see across the Dead Sea to the mountains of Moab. View east across the Dead Sea to Moab. Photo by Ferrell Jenkins. We associate the land of Moab with Ruth the grandmother of King David. We have had several things to say about Luke Chandler and his participation in the archaeological dig at Khirbet Qeiyafa (the Elah Fortress) a few weeks ago. This is because Luke is a friend and a former student. Luke has been interviewed by Gordon Govier on The Book and the Spade program. That interview emphasized the role of volunteers in archaeology. Now he has been interviewed for the Judean Eve program on Israel National Radio to discuss the use of blogs in reporting on archaeological work. To hear this interview you must look for the program entitled Tell Me About Digs. Click on Part 2 to listen or download the mp3 file. Follow this link for the interview. Luke’s blog may be found at lukechandler.wordpress.com. There is another interview on the same program with some guy named Herschel Shanks. Khirbet Qeiyafa is an important site historically because of the part it plays in the account of the conflict between Israel and the Philistines (David and Goliath). See 1 Samuel 17 for the full story.